Munnabhai's marriage with Manyata is under the knife of law system of Goa. The much hyped marriage of Sanjay with Manyata, which took place on 7th February this year, has been in trouble for the last few days. The latest news is that Dutt has come to realize that why Manyata was so eager to get married in Goa. Gossip mongers are of the opinion that Manyata knew the fact that if a Goan female domicile certificate holder gets married in Goa, she has the right to claim 50% of the property of her husband. Ganesha brings to notice what broke Sanjay Dutt's earlier two marriages and what is in store for him as far as marital life is concerned. Worried about your marriage? Ask any question and get your marriage prediction based on kundali. Sanjay Dutt was born on 29th July 1959 in Bombay with Scorpio Ascendant. Lord of the Ascendant i.e. Mars is placed in 10th house of career with Venus. Retrograde Saturn is placed in 2nd house. Ketu is placed in 5th house of love and romance. Exalted Moon is placed in 7th house of marriage. Conjunction of Mercury and lord of the 10th house of career i.e. Sun is placed in 9th house of overseas. Rahu is placed in 11th house and Jupiter is placed in 12th house. Ganesha notes that in Sanjay Dutt's chart, lord of the Ascendant i.e. Mars is placed in 10th house, which gives good physique and makes him a self made man. Venus is in star of Venus and is placed in 10th house with lord of the Ascendant i.e. Mars, which has given him name and fame in film industry. Ganesha notes that in Sanjay Dutt's chart, lord of the 7th house (house of marriage and marriage life) i.e. Venus is in sub lord of Rahu and is placed in 10th house of career. 7th house is aspected by Rahu, which is not good for marital happiness and harmony. Sanjay Dutt has an average married life. In addition, in Sanjay Dutt's chart, 5th house is afflicted by Ketu and lord of the 5th house of love i.e. Jupiter is placed in 12th house of adversary, which indicates that he may not get much success in love matters. In Sanjay Dutt's chart, exalted Moon is placed in 7th house and lord of the 7th house of marriage i.e. Venus is in star of Venus and is placed in 10th house of career, which is the reason for 5 to 7 years of age difference in spouses age and Sanjay Dutt's three wives have come from entertainment field. 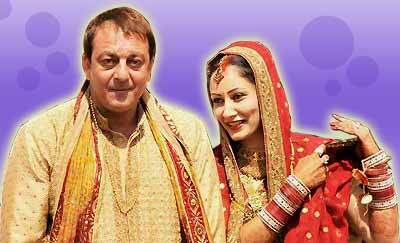 Sanjay Dutt married Richa Sharma, a small-time actress discovered by Dev Anand for his film 'Hum Naujawan' in 1987. Transiting Jupiter was passing through 5th house and was aspecting Ascendant during 1987. Sun is placed in Cancer sign. Sanjay Dutt's Moon sign (Janma Rasi) is Taurus and transiting Jupiter was passing through 11th house from Moon sign. Navamsha Lagna is Sagittarius aspected by Saturn and Jupiter from 7th house in Navamsha chart. Annual Chart (1987)-In 1987 Yearly chart, Varsh Langa is Capricorn. Lord of the 7th house of marriage i.e. Moon is aspected by year lord Juptier. Lord of the year i.e. Jupiter and lord of the 7th house i.e. Moon form an Ithasala Yoga. Vivah Saham is placed in Cancer in 7th house. Part of Fortune i.e. Jupiter is placed in Sagittarius sign and is aspecting lord of the 7th house i.e. Moon. Due to this planetary position marriage took place in 1987. Sanjay Dutt's marriage with Richa Sharma ended in 1996. Ganesha notes that Sanjay was under the influence of major period of Rahu and sub period of Moon, which started on 6th August 1995 and ended on 4th February 1997. Moon is placed in 6th house of disease in Cusp Chart. Moreover, transiting Ketu was passing through 5th house of love over Natal Ketu and transiting Saturn was aspecting lord of the 7th house i.e. Venus. This adverse transit and Dasha Bhukti were the root causes for the break up. Richa was diagnosed with cancer and the couple separated. Annual Chart (2001) - Sanjay Dutt again married Rhea Pillai in 2001. In 2001 Yearly chart, Varsh Langa is Virgo. Year lord Mars is placed in 3rd house. Lord of the 7th house i.e. Jupiter is placed in 10th house in Gemini sign, which is aspected by Part of fortune and is placed in Sagittarius and Vivah Saham, which is placed in Libra sign. Lord of the 7th house i.e. Jupiter and Vivah Saham forms an Ithasala Yoga. Vivah Saham and Year lord Mars also form an Ithasala Yoga. Sanjay Dutt was under the influence of marriage period of Jupiter and sub period of Saturn, which started from 23rd February 1998 and ended on 25th October 2002. Transiting Jupiter was passing through Ascendant and was aspecting 7th house of marriage. Due to this planetary position, marriage took placed in 2001, but this marriage ended in 2005. Ganesha notes that transiting Rahu was passing through 5th house (house of love) over Natal Ketu. He was under the influence of marriage period of Jupiter and sub period of Ketu, which started from 30th January 2005 and ended on 5th January 2006. Due to this, Sanjay Dutt and Rhea Pillai got divorced in 2005, after spending the last few years of their marriage apart. Rhea later married tennis player Leander Paes. Annual Chart (2007- 2008) - Sanjay Dutt has got married again to Manyata (Dilnawaz Shaikh), this marriage was performed according to Hindu rituals and was solemnised on February 11 2008 on Basant Panchami. In 2007 Yearly chart, Varsh Langa is Pisces. Year lord Jupiter is placed in 9th house. Part of fortune is placed in 7th house in Virgo sign. Part of fortune and Year lord Jupiter form Ithasala Yoga. Vivah Saham and Year lord Jupiter form an Ithasala Yoga. Vivah Saham is placed in Pisces sign aspected by year lord Jupiter. Sanjay Dutt is under the influence of major period of Jupiter and sub period of Venus, which will end on 5th September 2008. Due to this planetary position, marriage took place in 2008. Ganesha notes that Sanjay Dutt is under the influence of major period of Jupiter and sub period of Venus, which will end on 5th September 2008. Venus is lord of the 7th house of marriage, but again this marriage is also passing through so many controversies. Ganesha feels that transiting Saturn and transiting Ketu are passing through 10th house over lord of the 7th house of marriage i.e. Venus, which indicates that Sanjay Dutt may get some relief after 30th April 2008. However, the time upto this period is not favourable for Sanjay Dutt and Manyata as far as conjugal bliss is concerned. Wishing a good luck and May lord Ganesha bless Sanjay Dutt and Manyata!